Parents, children, grandparents, aunts, uncles, cousins, acquaintances and friends – everyone is required to purchase a show ticket to attend any of the performances at the festival, with the exception of babes in arms, who are welcome to attend selected performances at no charge. Babes in arms refers to babies under the age of 12 months, who will not require a seat, and will remain in the arms of their parent or guardian. * All ticket prices subject to GST and service charges. No refunds or exchanges. All show tickets include an Activity Village wristband. Our large Activity Village is enclosed in a beautiful park setting with dozen of interactive activities, visual arts workshops and lots of surprises! Please Note: Our on-site activities are NOT open during the Evening Shows. Show your ticket anytime during the Festival and you’ll get an Activity Village wristband for that day. For a day at the festival without a show ticket, purchase a wristband and enjoy our on-site activities. To enter site activities everyone is required to purchase a wristband. Wristbands are sold on-site only, cash only. Age ratings have been developed to ensure a positive and enriching theatrical experience for everyone. As a courtesy to the rest of the audience & the performers it is suggested that children younger than the ages listed not attend as they may become frightened or disruptive. Please refer to the performance pages for specific ratings. During the festival you can purchase or pick-up tickets @ the festival box office beside Studio 1398. You can purchase tickets for any available performance @ the festival box office up until 1 hour before the show – at which time you can purchase tickets at the venue for cash only. Shows often sell out so we recommend purchasing your tickets in advance. All venues are wheelchair accessible. Our activity site is wheelchair friendly. Good Neighbors Program: each year the Festival distributes performance tickets at no cost to low income families through Kids Up Front, a non-profit society that distributes free tickets for arts, culture, sporting and recreational events to child-serving organizations across Metro Vancouver. Adopt a Class: Over the past twelve years more than 30,000 children from school districts across the Lower Mainland have attended the Festival thanks to the generosity of corporate and foundation donors. This program provides return bus transportation and featured performance tickets for school groups in low-income neighborhoods across Metro Vancouver that would otherwise be unable to attend the Festival. Visit our information tent between Waterfront Theatre & Studio 1398. Our friendly hosts can help you find out anything you will need to know to plan your day at the festival. Lost children will be accompanied to our First Aid station. Both our team and Granville Island Operations are on radio and ready to assist in reuniting children with their school group or parents. In the case of a missing child, please contact any festival staff member for immediate assistance. All lost and found items will be handed into the information tent between Waterfront Theatre and Studio 1398. After the festival you can check in with our office at 604.708.5655. There are several bank machines located on the island. 1 at the back of Kid’s Market, 2 beside Edible Canada, 1 in the Public Market, and 1 at the Granville Island Hotel. Qualified First Aid attendants will be on –site. The First Aid station is located in the box office beside Studio 1398. Music performers often have CD’s for sale outside their performance venue. We will have a variety of food vendors set-up adjacent to the Activity Village. We will have stroller parking outside various venues. Sorry … But no thank-you! Dogs are allowed outside the festival grounds at Granville Island but are not permitted inside any of the festival venues or on the festival grounds or activity sites – working dogs excluded. Please respect the children and keep our site smoke free. The festival is held at a variety of venues on Granville Island in Vancouver, BC. All theatre venues are indoors & wheelchair accessible. 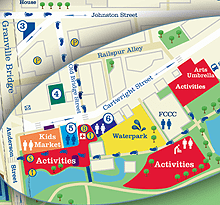 Activities – in the green space at Sutcliffe Park (beside the water park) and beside Waterfront Theatre.